Holy cow. If you thought Microsoft Office 2007 Ultimate was divine, wait till you see this. A Korean religious goods internet retailer appropriated called “GODpeople Mall” is now selling a version of Microsoft Office 2007 they call the Microsoft Church Package. Below is the ad from their website illustrating the product. I don’t understand any Korean so I won’t be able to interpret their description of the product which I’m sure makes a lot of sense, but the bible does not seem to come with the package which is a bit of a shame. On the same note, not too sure how Visio fits in the picture. Having said that, the bottom illustration indicates a price discount of an almost sinful 90%. Having had a quick look on the Microsoft Korea website, I couldn’t find any references to this package so it is my assumption that this has not been officially endorsed but a mere bundle put together by retailer. Smart move nevertheless. Hello all Internet Explorer blog readers. Welcome. Make yourself at home. Less than an hour ago, Dean Hachamovitch published a new post on the Internet Explorer blog about “Trustworthy Browsing”. I quickly scanned the article looking for interesting tidbits when I came across an interesting link. “www.somebadsite.com”. Whilst trying to explain the security improvements Internet Explorer has implemented, Dean used “somebadsite.com” as an example of what a malicious website could not do. Curious like a cat, I clicked the link in anticipation it was a placeholder and would redirect me to Microsoft.com. Then the opportunity struck me like the Phoenix rover found ice. I hastened myself to my domain registrar and got everything sorted out within the minute. Long story short (pun), I am now the proud owner of somebadsite.com which currently redirects here. In conclusion, Dean, thanks for the link. I owe you one. P.S. If any person or security company would like to purchase this domain for novelty’s sake or demonstration purposes, I’m open to all charitable donation offers. Please leave a comment or send an email. Update: As Daniel pointed out in the comments, Dean seems to have removed the hyperlink and my trackback as a direct result of this. I guess my 5 minutes of fame was pretty literal. When most progress bars try to exaggerate the speed of progress, this is by far the most conservative. In case you were wondering, it does actually fill up full at 99 or 100%. Perhaps instead of a linear algorithm, it’s logarithmic? Go figure. Microsoft Australia has recently put together an advertising campaign for Windows Vista called “I can do that”. The premise of the campaign I assume is to demonstrate what you can do with Windows Vista, but I’m not too sure about the execution. For example, take a look at this commercial which a variation of has been playing on at least two popular Australian commercial radio stations. I don’t know about you, but this is quite an annoying advert. At least one other Aussie share the same feeling. It’s downright amateurish and borderline cocky. What little of the end result we see is nothing to be proud of anyway. The kid who plays the director just makes me want to punch fluffy animals. The ad is not engaging, interesting or even informative. If it wasn’t for this, I wouldn’t dare show anyone else. A related online campaign at one of the radio station’s websites is equally bad. 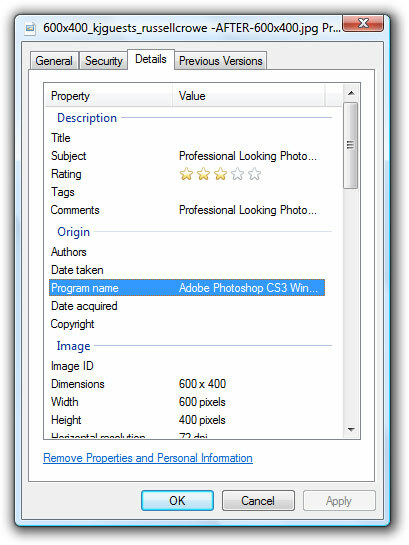 It aims to show the difference between “before” and “after” processing by Windows Live Photo Gallery. At a glance, it’s basic exposure correction. If you pay more attention, it’s actually also airbrushing the wrinkles on the people’s faces. Something Live Photo Gallery cannot do and obviously post-processed in Adobe Photoshop (check EXIF). If this is in any way related to the $200 million advertising fund injected into Vista this year then that’s even more disappointing. Maybe try McCann Worldwide instead? The Zune is great for watching movies, TV shows and YouTube clips of cute kittens, but sometimes it can take a good chunk of time and a bit of magic getting your videos ready and loaded on the Zune. There’s nothing worse than having spent a good 30 minutes transcoding an axxo-ripped XVID movie (yes you know what I’m talking about) into WMV, added to the Zune library for it to spend another 30 minutes transcoding it again because it wasn’t the particular type of WMV it was fond of. I’ve tried this and I’ve tried that, Encode360 was good up and until a few video formats it just had difficulties with. Just recently, I’ve finally found the perfect codec settings for the free MediaCoder software to transcode just about any video I throw at it and would sync without a second conversion. Do try this at home. Step 1: Download and install the latest version of MediaCoder. There’s a new version of this app almost every other week so it’s good to get the latest version whenever possible. This is probably the best use of a Windows desktop clone ever. Colenso BBDO, a New Zealand advertising agency (who have done some really spectacular work) came up with this innovative idea to disguise literature as PowerPoint presentations to encourage people reading at work (without being told off) on behalf of the New Zealand Book Council. The result, is a Windows XP clone presented in a fullscreen Flash application complete with a login screen, start menu, folders and windows. After you’ve browsed the titles available categorized by genre as folders, double clicking on them will launch a full-screen slideshow in the style of a PowerPoint presentation. Here’s where it takes it to the next level. The text is divided amongst the headings, subheadings, paragraphs, bullet points and even diagrams. Everyone around you would be none the wiser. Even if you’re not at work, take a quick look at “Read at Work“. Where this concept falls short is if your workplace uses Windows Vista, the fake Windows XP desktop would be a dead giveaway, but apparently none do anyway.